Look what is here! Our website is officially up and running, come check it out! 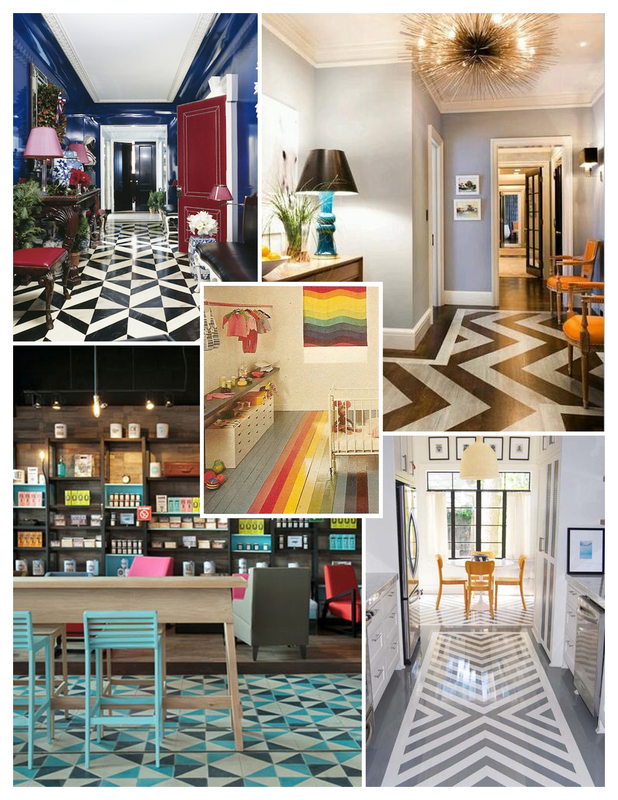 With a twist of pattern and pop of color, flooring trends are on the rise adding pizzaz to any interior. And with Pinterest taking over the world, we love the hands-on DIY projects and “how to’s” especially when you want extra pocket change at the end of a project. These projects can add up fast so make sure you do your research before taking on such a large task. 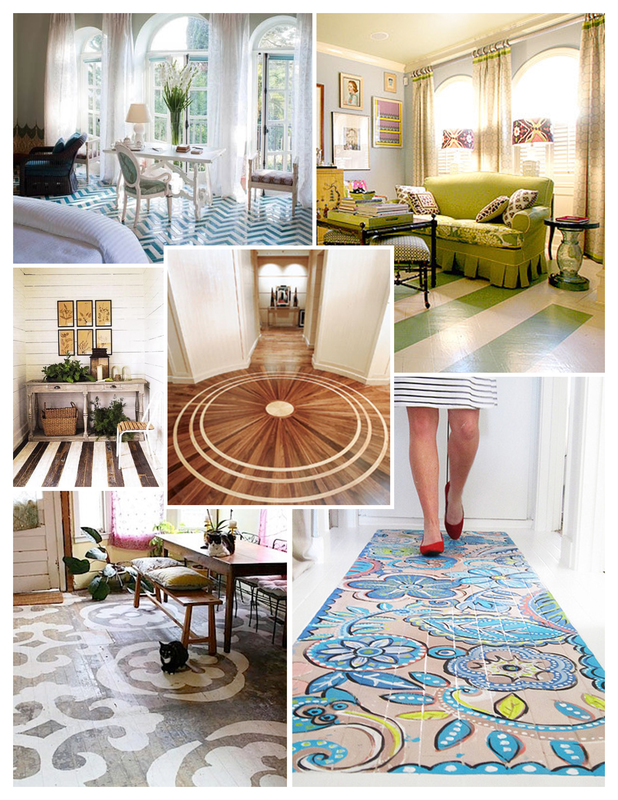 Who needs a rug when you have floors that look like these? 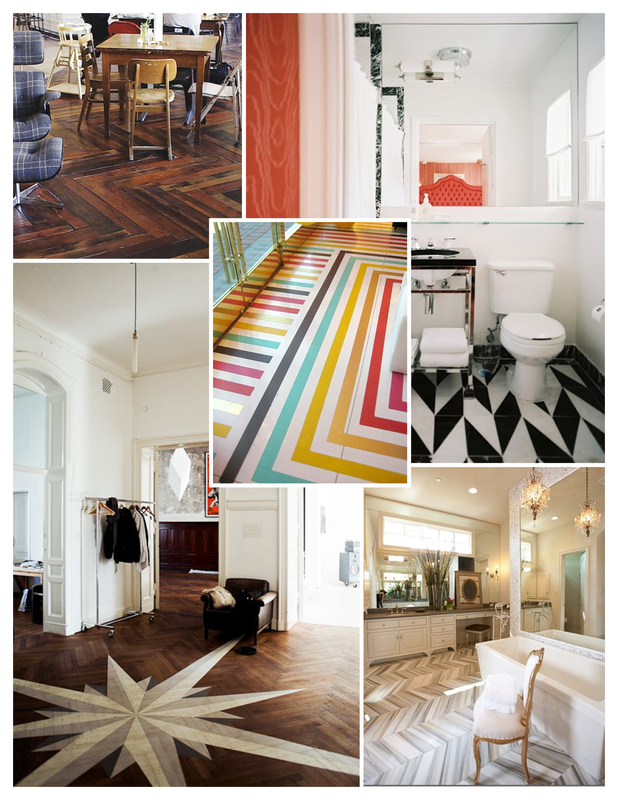 *Our suggestion: painting wood floors is an inexpensive fix but we only recommend painting wood floors when the wood is unrepairable or you have purchased flawed salvaged wood with the intension of painting. If the wood is in good condition, staining and refinishing the floors add more value to your home and reveal a classic, timeless look. 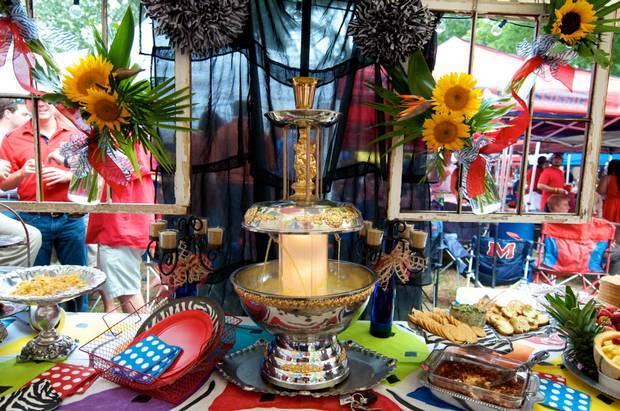 Since Southern football tailgates deal with decorating a tent, it can count as design right? 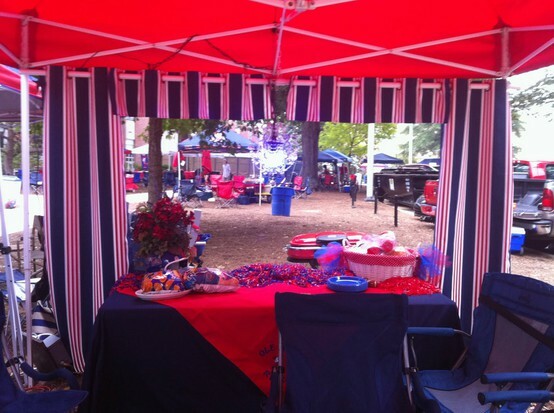 We have been so wrapped up with the whimsical thought of actually putting faux curtains on a tent that we had to share ideas and pictures of what we would call extreme tailgating. 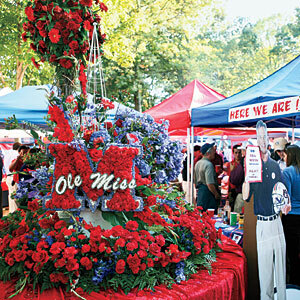 Any native from the South knows that football season is also known as Fall, ha ha. 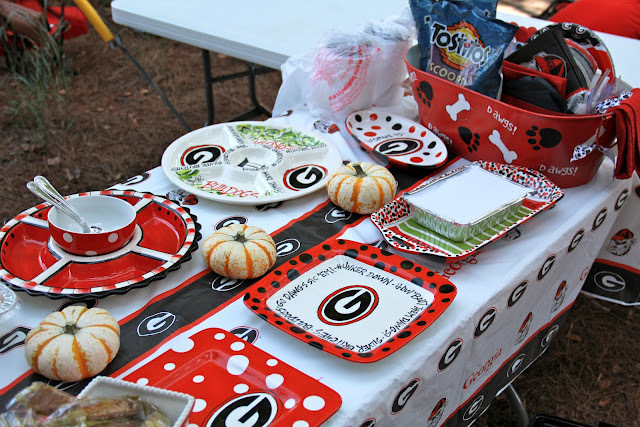 Most of us get all dolled up in our team colors, whip up some delicious goods and celebrate victories throughout the season. 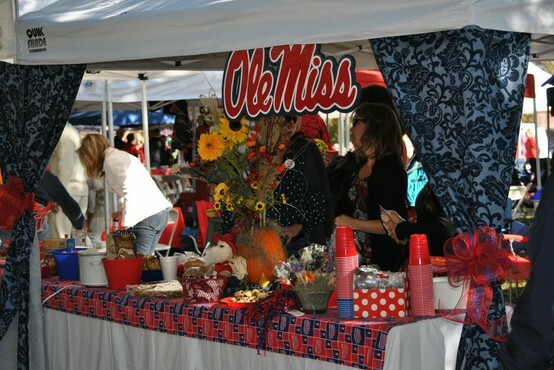 And others go the extra mile in creating the most fabulous tailgating tent known to man. 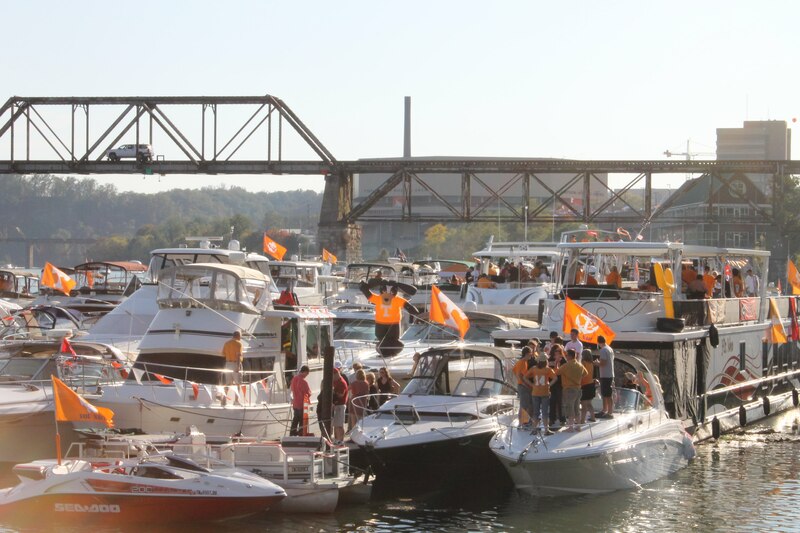 With our favorite team being new to the SEC in college football, we had no idea what we were up against. 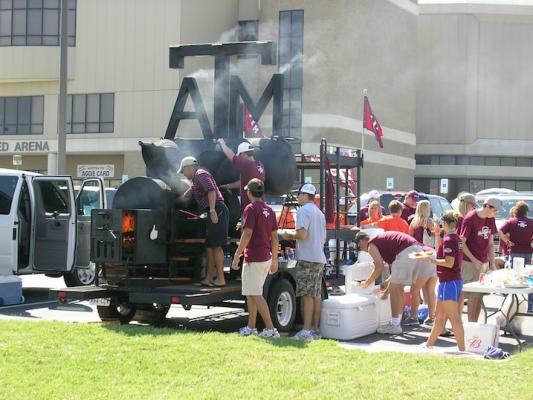 And no, we aren’t talking about football, we are talking about TAILGATING. 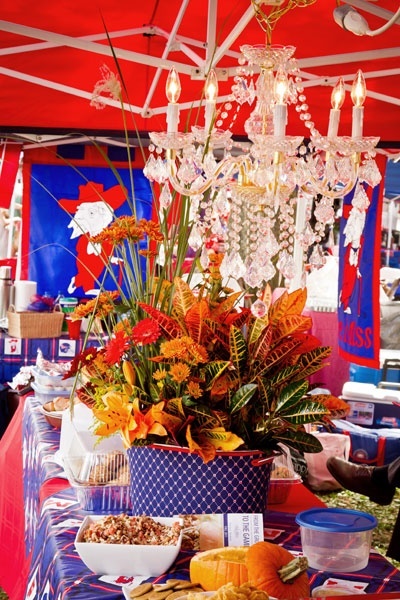 From floral arrangements to white linen spreads, yachts to chandeliers, these football fans don’t live it down especially Ole Miss and Tennessee. 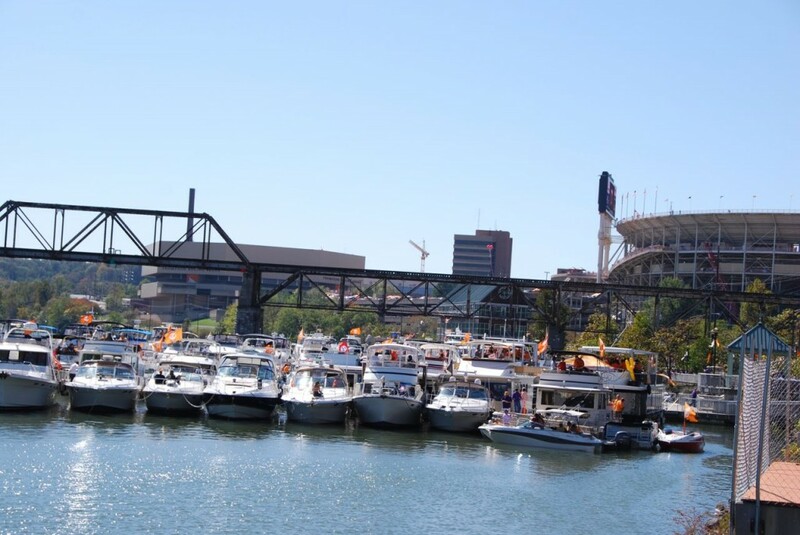 We have to say that the Tennessee Volunteers have one of the most unique tailgates with yachts linked together on the Tennessee River. Top notch, silver and all. 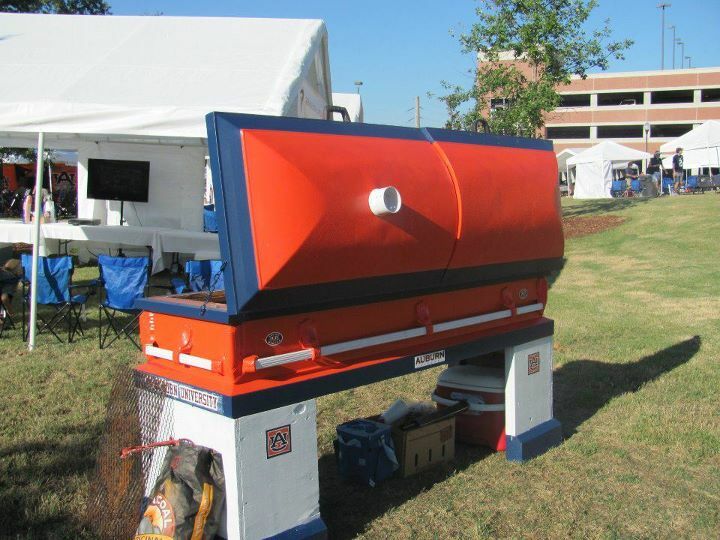 A tailgating dream…life would be so easy setting up camp. 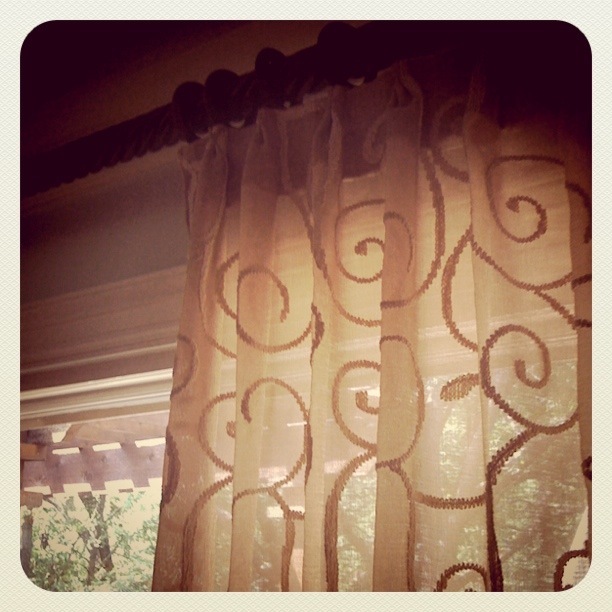 Note: Faux curtains that hide gazebo poles. Aren’t these super fun?! 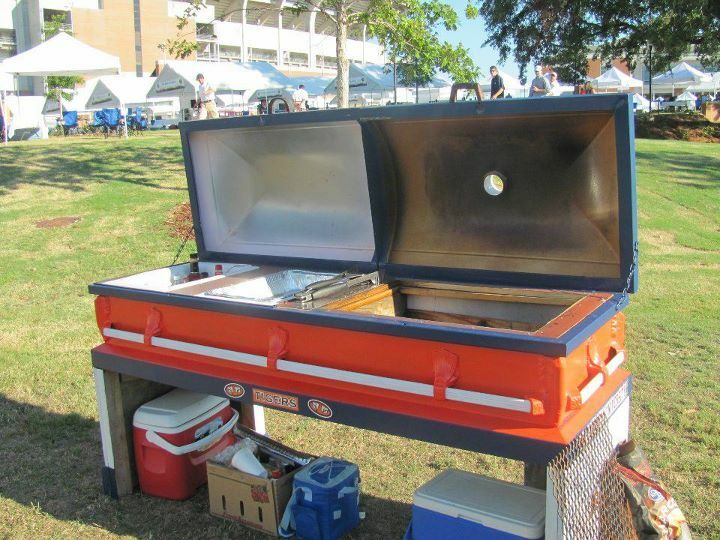 They are a must at our next tailgate. 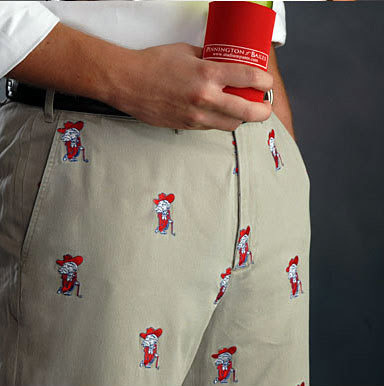 We are all about showing school spirit but thought these shorts were like WHOA and the grill below is WAY extreme. 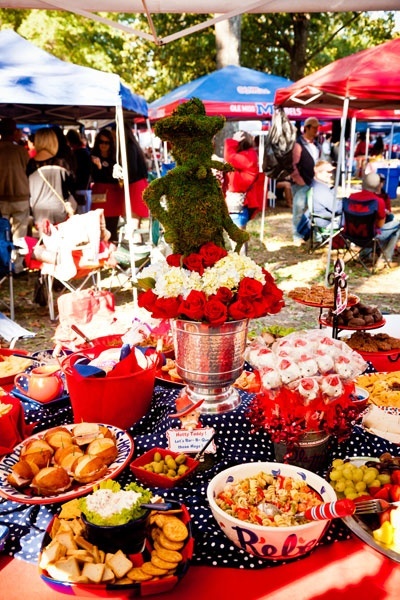 Southern Living’s “Vote for Who Throws the South’s Best Tailgate” sweepstake of their top 20 schools with the best pregame parties has ended with the #1 winner will being announced on Oct. 15th. Check out their top picks on other categories such as most spirited, most traditional, the powerhouses and style setters. Are you ready for some FOOTBALL???!!! It’s that time of year to start sprucing things up for the holidays! 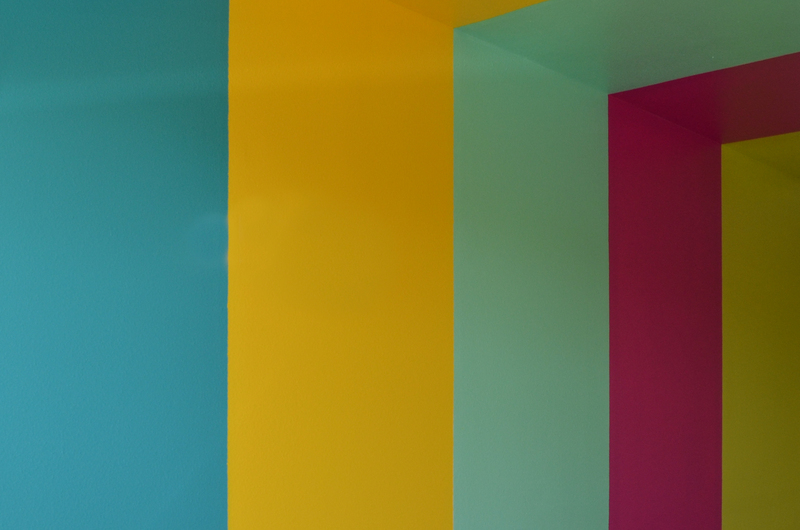 So today we wanted to give everyone a chance for a new do with a FREE TWO HOUR INTERIOR DESIGN CONSULTATION with a mini-re-fluff (of your current stuff). 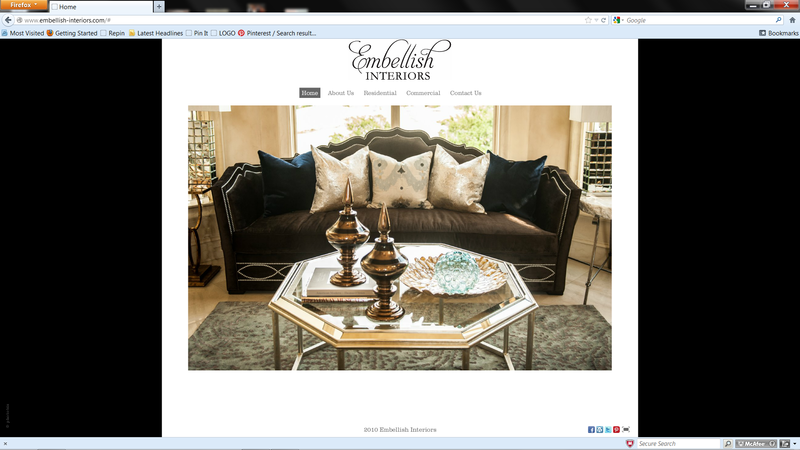 LIKE Embellish Interiors on Facebook. 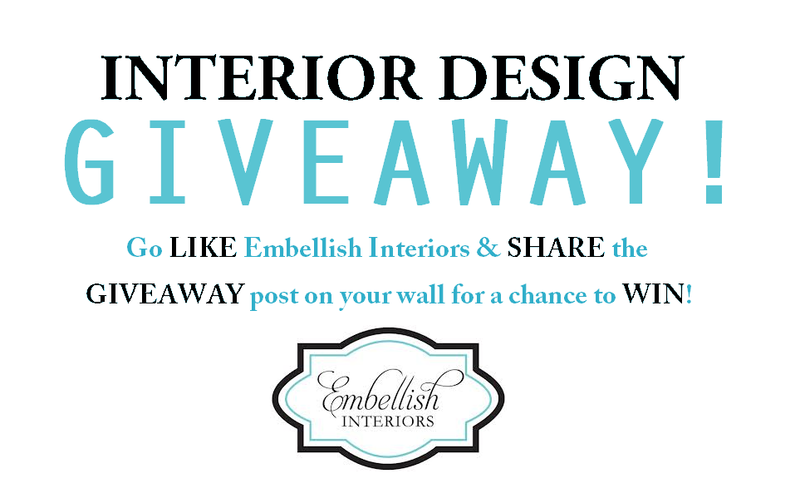 SHARE the GIVEAWAY post on your wall. Little recap, LIKE and SHARE are a must to be entered. 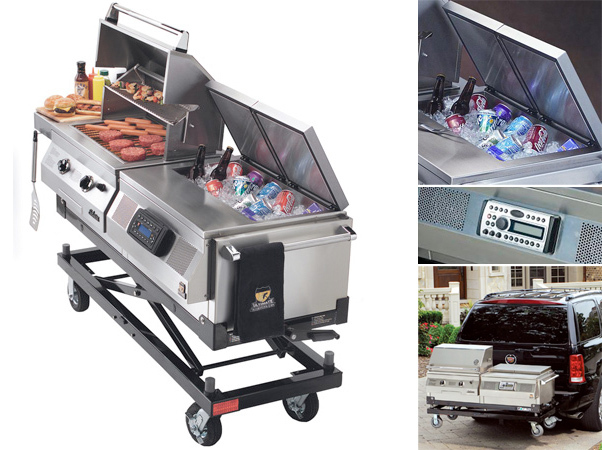 Earn (2) extra entries by following us on Twitter or Pinterest. The prize can not be exchanged or used for monetary value. 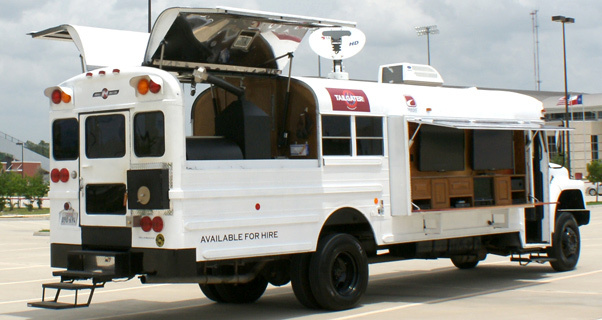 If winner isn’t within the DFW/Gainesville, TX area, online design will apply. Winner will be chosen on Wednesday, October 3, 2012. WOWZERS! Is it fall already?! 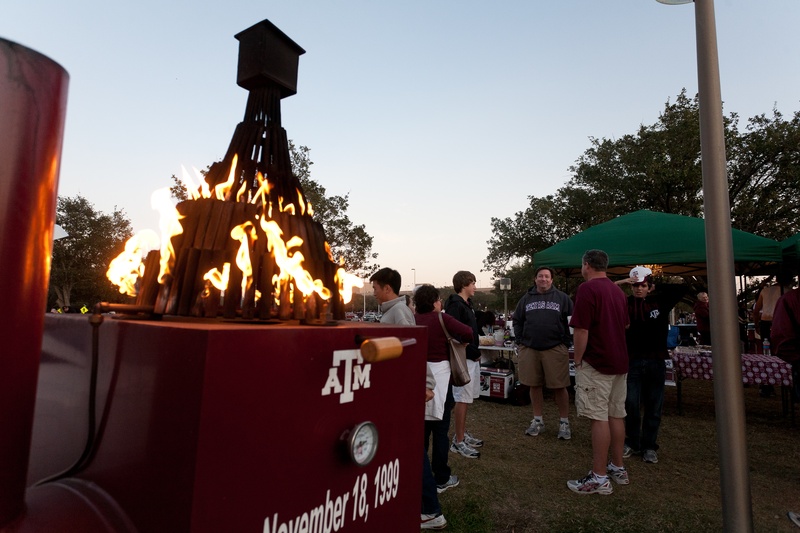 Between summer ending, adding in a looong vacation, birthdays, and Ring Day for my baby sister, Elizabeth (Gig’ em), we have SO much to catch up on. Bare with us as we step back into time to recap life and a couple of our designs in the world over the past few weeks. Hmmm, where to start…we have had the pleasure of working with one of the sweetest couples from Sugarland that needed their newly purchased home to be revamped for their new beginning in the DFW area. There has been a lot to do and quite a bit of face-lifting on the agenda. 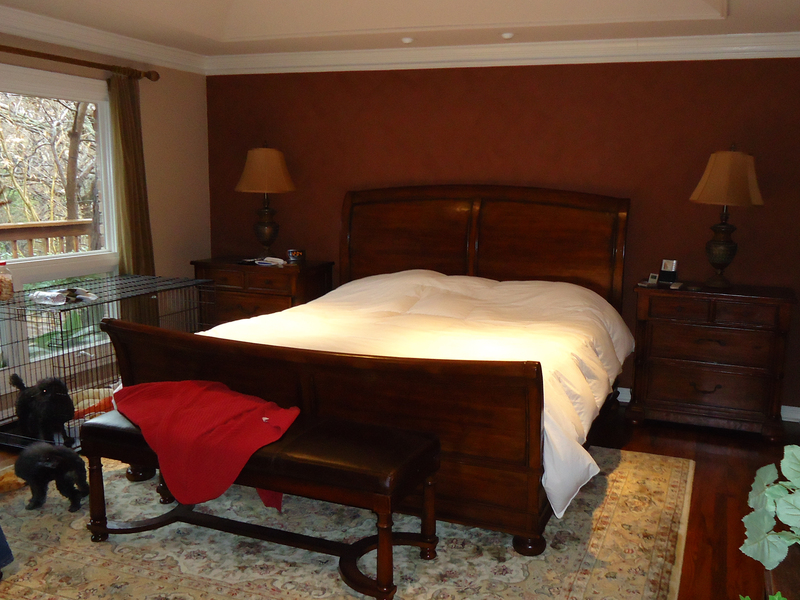 New paint, new bedding, custom draperies, custom shutters, the list goes on and on, but WOW the transformation is unreal! 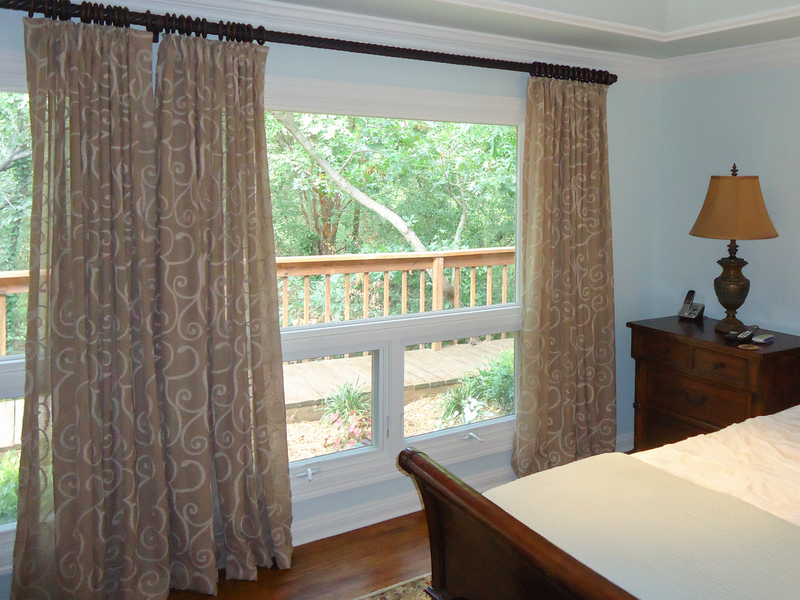 The project is still in progress so we wanted to show a tiny before and after of the master bedroom paint and custom window treatments. 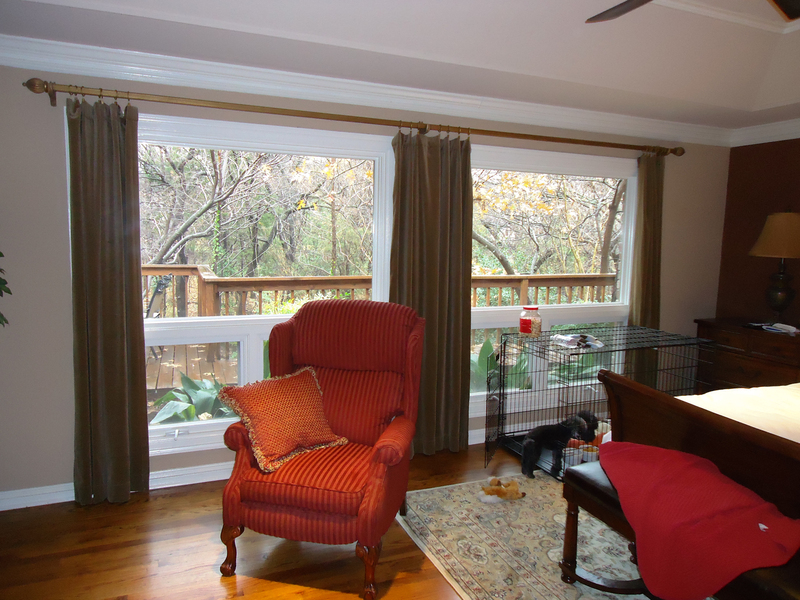 BEFORE: The master bedroom was a dingy downer before but had great natural sunlight to the room. AFTER: The “Embellished Blue” (yes, that really was the name of the paint color) not only made the room look larger but added a bit of cheerfulness to the room as well! These pictures show the color to be a bit more vibrant than it really is. The sheer linen draperies really warmed up the room. We loved the detail in the scrolled stitching. In the mix of working on this project, we started the designing the new YODREAMS YOGURT in Waco! 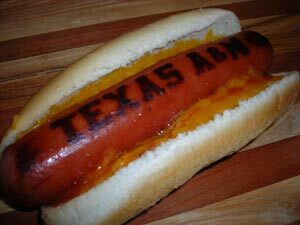 They are going to have a big GRAND OPENING so those of you Baylor fans, students and locals stop by sometime for a yummy treat. Pictures are to be taken next week so until then we have this pic for all the suspense and to be a little tease! 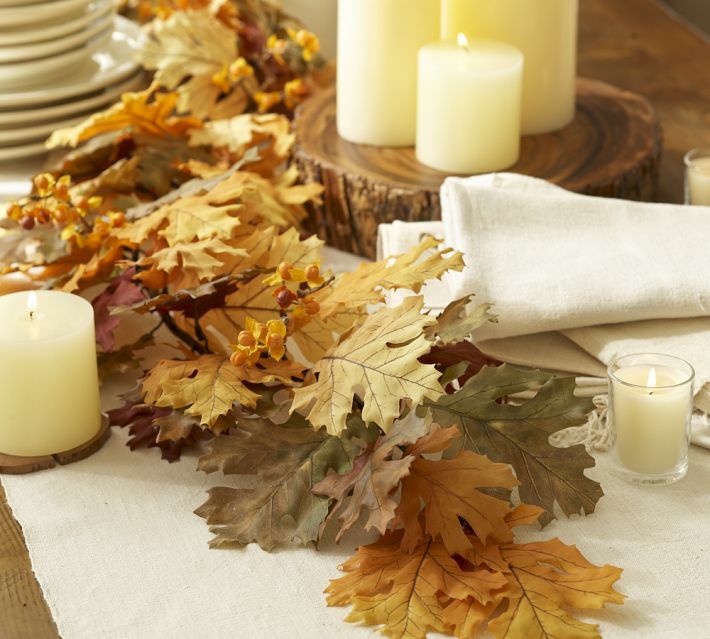 With fall being here, we have been switching out our summer decor with garlands of fall foliage, acorn filled hurricanes, mercury glass pumpkins and gourds. Anyone have some of these??!! 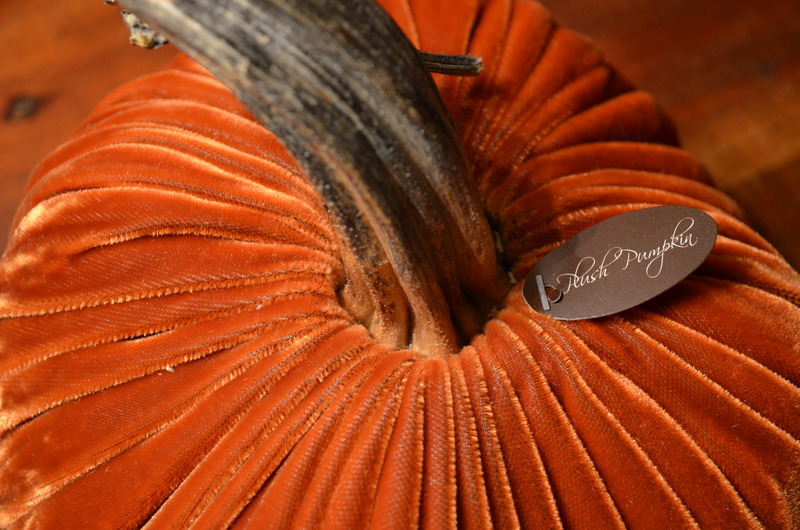 If you don’t, Plush Pumpkins are a must have! 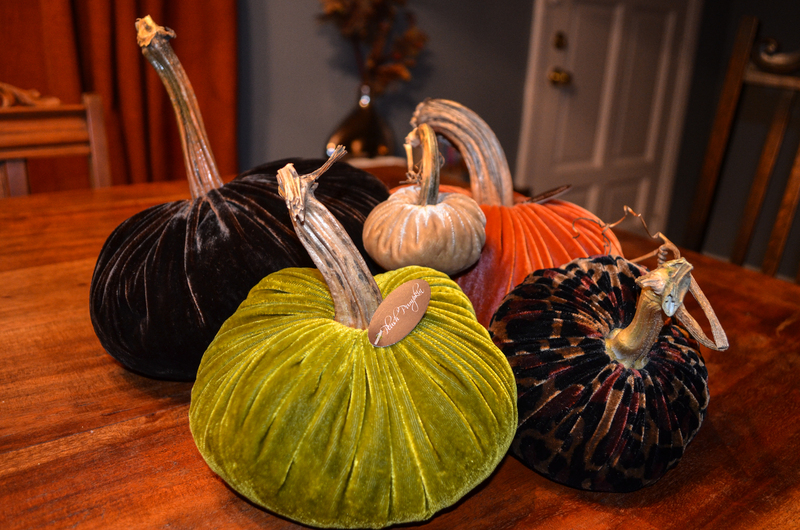 We wish they could be out on display year round because we love them so much. They also have acorns (adorable! ), mushrooms and hearts. 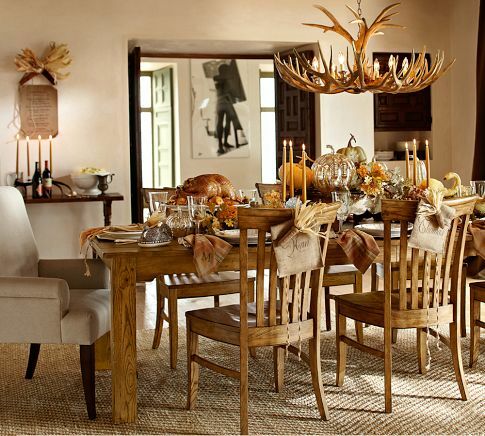 Sometimes prices on these type items start to add up fast, we love trying to mimic the same look on a lower budget. 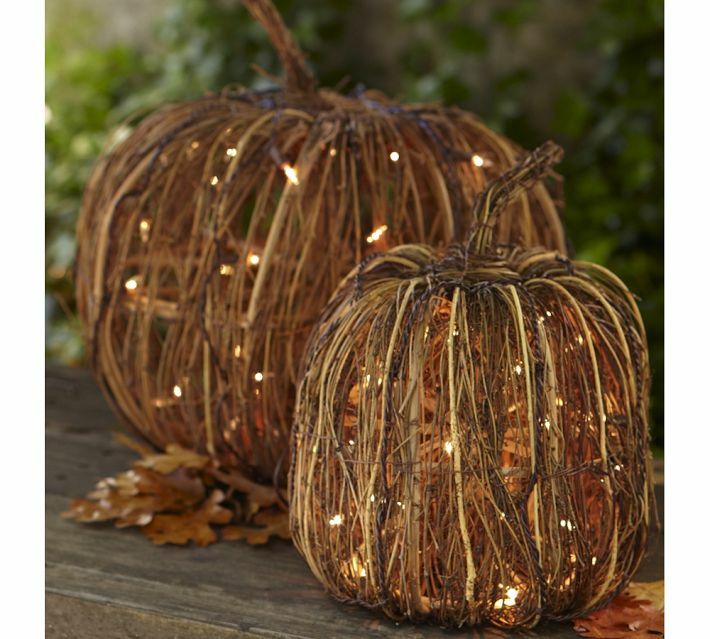 The pumpkins with lights can occasionally be found at TJMaxx, Ross and Marshalls for a fraction of Pottery Barn’s price. Birds similar to the crows and black birds (on the front porch pic) can be found at Dollar Tree. 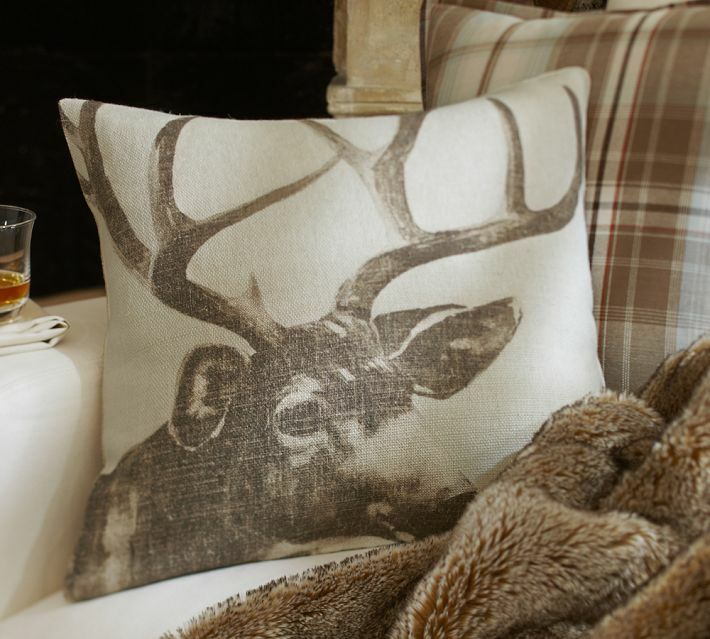 And there are many different ways of screen printing images onto fabrics for the antler pillow look. 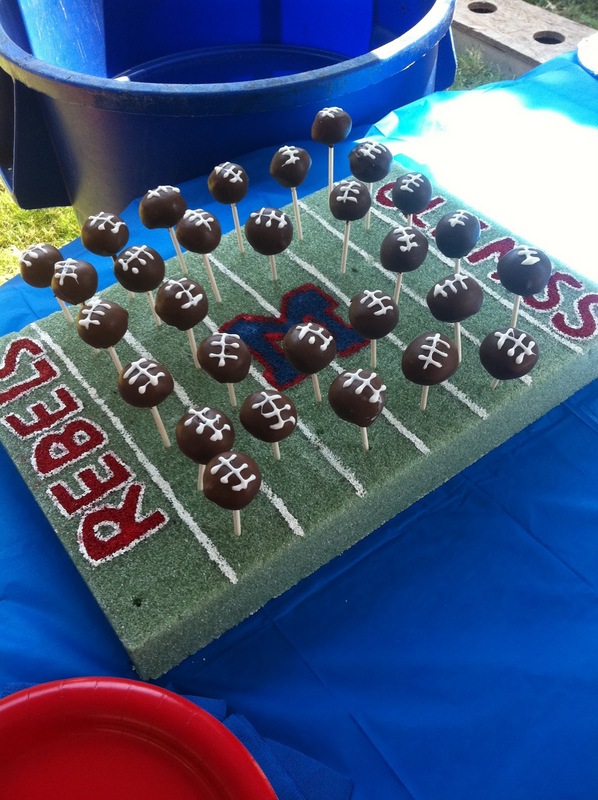 Check out our Pinterest page under the DIY board. 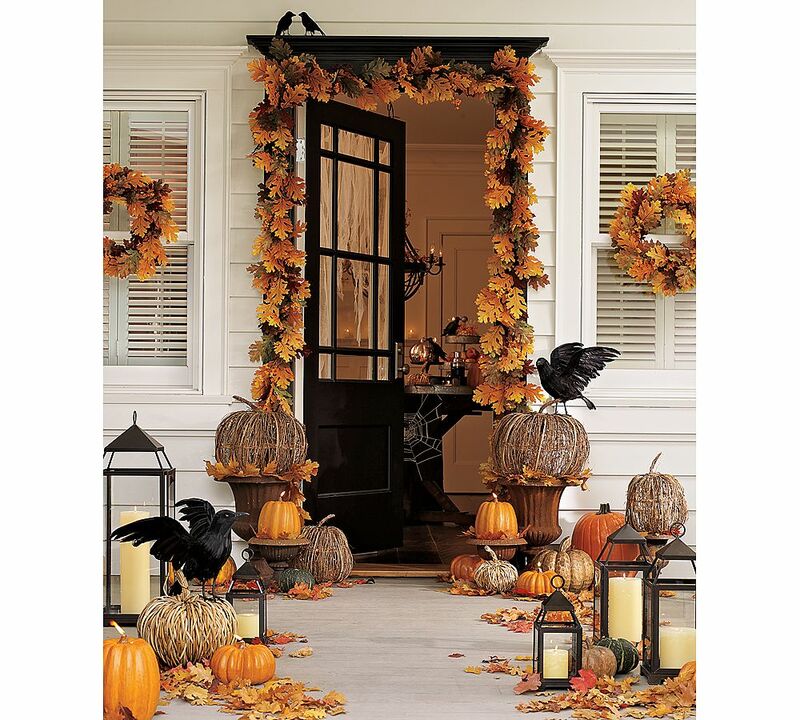 Hope everyone is making their homes picturesque with lots of pumpkins, scarecrows and berry branches! Once again, HAPPY FALL Y’ALL!